The PDF Splicer iPhone and iPad productivity app makes a simple task of combining, editing, and sharing PDFs. By incorporating excellent, intuitive gesture control and simple navigation, you can manipulate PDFs with great ease and success. When you open the PDF Splicer productivity app, you are encouraged to watch a short video to give you a feel for how to use it effectively. The video is extremely accessible and helpful. 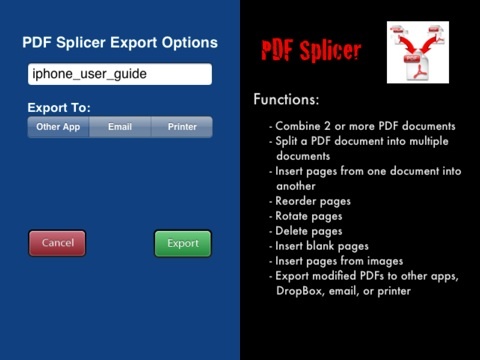 The PDF Splicer iPhone and iPad app incorporates the vital functionality of a PDF application for 90% of PDF users. Generally, PDF users need to reorder pages, insert an image here and there, rotate a page, and share pages. The PDF Splicer iPhone and iPad app has a workhorse interface. It is free of visual clutter and graphic touches, but has clearly defined and well-planned navigation. The left side of the screen has the function buttons that are activated with a touch–rotate, copy, insert, delete, export, and select all. There are no icons to decipher, as the developers at Tipirneni Software LLC wisely chose to use colored buttons with text to explain functionality. Below the buttons, you see a thumbnail of each page of the PDF chosen. On the right side of the screen, you see the highlighted page in a larger view. You can open any saved PDFs with the PDF Splicer iPhone and iPad app, or you can choose to open it from the drop down menu of applications capable of supporting PDFs. You can reorder pages by simply dragging and dropping pages. Or, if you have a large document, you can renumber the page to properly insert the page in just a couple of touches. You can select large numbers of pages to move, rotate, or delete with finger taps highlighting top and bottom pages. Just as you can move selected pages, you can rotate pages by simply highlighting and pressing the appropriate function button at the top of the screen. When a scanned document needs to be adjusted from portrait to landscape, PDF Splicer’s iPhone and iPad app takes care of that item in two touches on the screen. Another neat feature is the ability to insert images into your PDF. PDFs stored within the PDF Splicer iPhone and iPad app use the internal clipboard, and images on a clipboard generated by another application or browser are stored to the external clipboard. You can also incorporate images from your iPhone and iPad’s libraries using the external clipboard. When you are ready to paste your image, you press paste and a menu including the different clipboards appear. You select source, and your image is uploaded. You can select specific pages or entire PDFs to share via export to an application, attach to email, or print. PDF Splicer’s iPhone and iPad app includes clear, responsive functionality, and it solves the vast majority of PDF issues. Th $4.99 price is a bit high but seems reasonable. AppSafari review of PDF Splicer was written by Jenni Ward on April 21st, 2012 and categorized under App Store, Utilities. Page viewed 4933 times, 1 so far today. Need help on using these apps? Please read the Help Page. I’ll buy it to try. I heard this application very well.